I'm back with another five minute Friday post! This week's topic is support. Support comes in many forms - money for a marathon or GoFundMe page, volunteer hours at a non-profit or community center, or even listening to a friend. It can often go unnoticed if it's not the visible kind. Don't be discouraged. Then there's the behind the scenes, labor-intensive kind. Is it any less valuable? Something to think about isn't it? What support have you given lately? What support have you needed and not received? With all the natural disasters that have recently occurred, support has become a huge buzzword. I pray that we as a community can adopt a lifestyle of support. Circumstantial support is great, don't get me wrong, it just doesn't always have staying power. 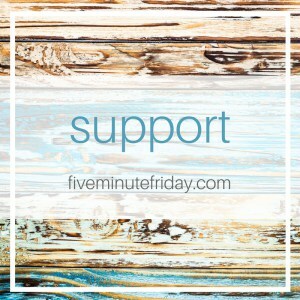 Here are three ways I incorporate support in my everyday life. Listening. This is a big deal, we have two ears and one mouth for a reason. Encouragement. Speak affirmative words into the lives of those around you. Prayer. This can be done any time and anywhere with lasting impact. Looking for more tangible ways? Search your church, small group, and/or community for other ideas.